On 12 December 2017 the Hungarian Parliament passed the amended Act on Vocational and Adult Training, opening the way for establishing sectoral skills councils (SSCs). The dynamic development of the Hungarian economy and the speed of current economic and technological changes are forcing the vocational education and training (VET) system to adapt continuously to new demands. 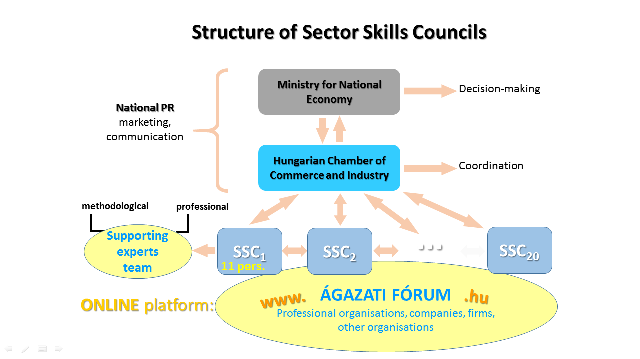 Following the positive example of sectoral skills councils in other EU Member States, the Hungarian SSCs aim to prevent and overcome skills gaps, skills shortages and skills mismatches, and create strong links between the business work and education, further aligning vocational training programmes with employers’ needs. A sectoral skills council can be considered representative if at least 51% of its members are economic stakeholders working in the same sector. SSCs will establish their own procedures; their members may vary from 7 to 19 persons per SSC, depending on the sector. Other VET and economic stakeholders (schools, teachers, business federations and economic entities) may support the work of the councils, issuing opinions or making proposals through an online digital platform currently under development. analysing and forecasting skill needs by sector to develop short- and medium-term plans for training activities. SSCs are coordinated by the Hungarian Chamber of Commerce and Industry and the Hungarian Chamber for Agriculture for its own sectors. SSC representatives will take part in the National Council for VET and Adult Learning, a countrywide forum for reconciling professional interests, representing the sectors vis-à-vis the Hungarian Government. A total of 20 sectoral skills councils will be set up for 41 economic sectors. Of these, 13 SSCs (for engineering, tourism and catering, commerce, information technology, etc.) were set up in 2017, while new councils in sectors such as services, food industry, and agriculture, are being formed in 2018. Their mandate starts in July 2018 when the national legislation comes into force.